ceft and company was created not because we too wanted an agency, but because the agency we wanted didn’t exist. in other words, we wanted a think-tank with muscle, able to produce just about anything. it is perhaps too forward to say that ceft and company “is like no other agency” or that it is “a rare pearl” unless of course such words were uttered by others, such as the executives of nike and LVMH. we indeed do see ourselves as different, not better or worse, but different. we are different in the way we approach challenges. traditionally, no matter what the goal, an advertising agency would sell you an ad campaign, and a digital agency would sell you a digital campaign. our creative lab has been asked to consult with architects, become a spokesperson for a brand, create products, advise on merchandise to be carried, name products, create identity and packaging, secure brand-ambassadors, design and produce events, advise on sponsorship, consult rock bands, and position products on a global scale. 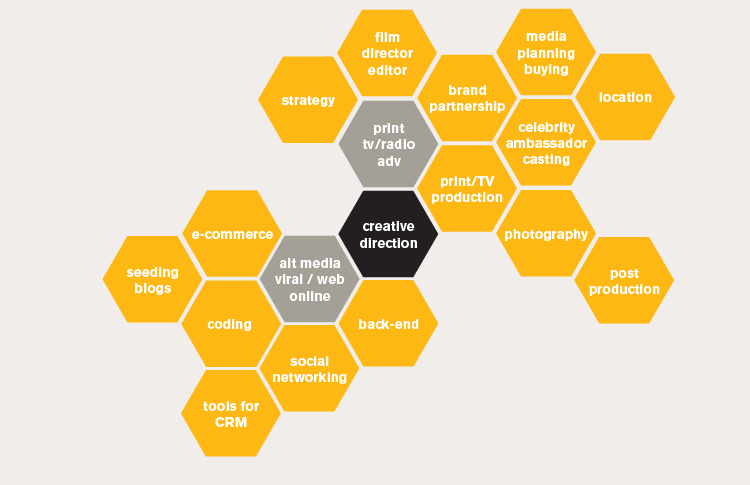 we have done all of this, and produced numerous award-winning ads and digital programs. our dream project would be a partnership with a brand to handle all creative assets. we would like to help create from the brand’s inception to its achievements, or from its current success to its future growth. find us a project where every aspect of the brand is under the same direction, from its naming and identity to its spaces, its product, its services, and finally its communication… and just maybe, advertising will have no place in such an endeavor.